Exciting post this week! 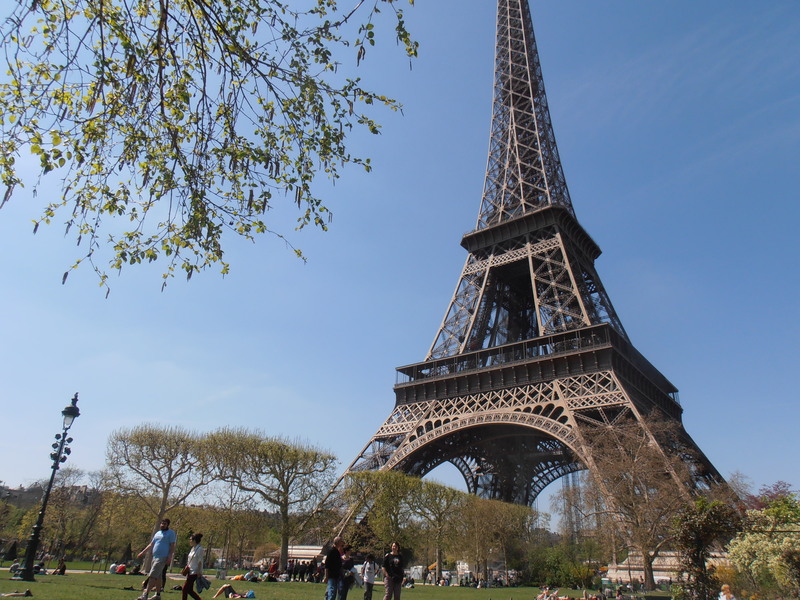 I actually did stuff (= went to Paris for 5 days with my friend Sarah)! Yay! Day one started in true fashion getting up at an illegal hour to catch a train. As usual, I went to bed far too late/early the night before and barely slept as I was paranoid about going back to sleep after my alarm (a growing problem). It was worth it though as we arrived in Paris around 10am meaning we essentially had a full day. First of all we headed to where we were staying to drop off our bags. If anyone hasn’t heard of airbnb, it’s basically a website where you can find rooms in people’s houses (or whole properties) to stay in – like couchsurfing, but classier. So off we trotted to meet Simon and Sarah, who like true British expats insisted on giving us tea and having a chat before we got started with our day. First on the list was the Musée d’Orsay, a former train station converted into a museum housing predominantly 19th century art. I was particularly excited to visit as one of the art history papers I did last year (ARTH222 for any budding art historians out there) pretty much covered exactly what was in this museum. Photos weren’t allowed but I managed to illegally covertly get snaps of all the works I’d learnt about last year. Yay! From there we headed to the Latin Quarter and got a refreshing beverage at Les Deux Magots, former haunt of Hemingway, de Beauvoir, Sartre and the like. This turned out to be unnecessarily hard with a rather stressed waiter, and meant we didn’t have time to get to the Pantheon before it shut. This did turn out to be somewhat of a blessing in disguise as it meant I could savour my €7 (!) hot chocolate). We then frolicked in the Jardins de Luxembourg before dining on crepes by the Seine. My chicken and ham one had a distinctly tandoori flavour…go figure. Day two started bright and early at 7:30 with a copious breakfast of cereal, croissants, baguette, yoghurt, orange juice and tea/coffee. By 9am we were on a train to Versailles! Unfortunately, even though our visas meant we are residents and therefore didn’t have to pay/buy a ticket, we still had to line up with all the peasants to get in. Also unfortunately, Sunday is Versailles’ busiest day and our slow start meant we did not beat the crowds. After a mere 30 minutes though, we were in! We started with the royal apartments, which were very impressive in a ‘how much dripping luxury can we stuff into this room’ and also ‘how many tourists with absolutely no self awareness can we stuff into this room’ way . Highlight for me was seeing the portrait of Louis XIV featuring the famous baroque ‘swagger’ pose; I kid you not that is an official historical term. We didn’t last long in the hordes and then went to find lunch in the gardens. Not in the gardens. In a RESTAURANT in the gardens. The waiter did a double take when Sarah asked for mulled wine (it was pretty bloody hot) but he was really nice, as was the food. We then trekked allll the way to the other end of the estate to see Marie Antoinette’s hamlet, were she (apparently) liked to play at being a farmer gurl. Or maybe just get away from the hubbub of the court. We’ll never know. Then we saw the Petit and Grand Trianons, other ‘buildings’ (not quite palaces) meant to more ‘intimate’ getaways. Then we roamed around the gardens, caught the end of the fountain show and coincidentally left just as it must have been closing. There was then great confusion with apparently no-one on the train knowing if it was going where we were all wanting it to. Luckily it did. After dumping our stuff and zonking out for a few blissful minutes, Sarah and I hauled ourselves out to get some dinner. I think we were in bed, asleep, by 10:30. We then continued up the Champs Elysées until we stopped at Ladurée, inventors of the macaron. I think the pictures speak for themselves really. We had to queue for abut 10 minutes, and in true me fashion, I opted not for a prestigious macaron but a multi-layered dark chocolate concoction. No regrets. Thenn we continued up the Champs Elysées until we reached the Arc de Triomphe where, you guessed it, we montéed à pied. Are you getting a sense for how much walking we were doing yet? Times like these I really wish I had a pedometer! We spent a while at the top, admiring Paris, and just how far we’d walked. We then noticed that the infamous traffic down below had stopped and there was a small group casually walking across the road. After descending and observing what looked like some ind of very official ceremony, talking to a soldier with a dubious accent (who we didn’t believe) and then having it confirmed by two overly-friendly policemen, we learnt that this does in fact happen at 6:30pm every day; the lighting of the flame on the tomb of the unknown soldier (not warrior, they’re not as cool as NZ), with military officials, veterans, flags, fanfare and children with flowers. We were very impressed. After that we got the metro right across town and paid a quick visit to the Centre Pompidou, which was right next to where we were staying and was open till 9pm. Daylight saving and doing so much in the day meant it was very easy to lose track of the time! I’m not a huge modern art ‘enthousiast’ but it was cool to check it out. We then went home and crashed and very reluctantly hauled ourselves out to find something to eat only for the sake of not going to bed on an empty stomach. Luckily our friend the crepe man on the corner was open 24/7. We started off with a savoury crepe (never get a mince crepe. that’s all I’m saying) which we ate by the rather creepy Stravinsky fountain, before working up enough appetite for a sweet one as dessert. After that we crashed. Day four was a big day as we had to first of all get across town to drop our bags off at Sarah’s friend Amanda’s place, who we were staying with that night to justify the airbnb. We left there probably just before 11 and headed to Montmartre, where we were embarking on the Amélie pilgrimage. What it sounds like – staking out locations used in the film. Then we went to Sacre Coeur, where an Aussie I kindly took a photo for told me (more than once) that I sounded British, before we once again decided to climb the dome. More great views but I am really not a fan of these claustrophobic spiral staircases! After that, determined not to backtrack we meandered through Montmartre and a few more sights (Le Moulin de la Galette and le Bateau Lavoir, Picasso’s home /studio for 12 years) before we finally made it to Les Deux Moulins, Amélie’s café, where we had lunch. We had another odd experience with a shirty waiter who then decided halfway through the meal that actually he quite liked the look of us and decided to be nice. Next on the list was Père Lachaise, in a nutshell a cemetery where a lot of famous people are buried. Sounds pretty morbid. It probably was. It is one of Paris’ most famous tourists attractions though, Jim Morrison and Oscar Wildes’ graves being particular pilgrimage destinations (though the latter not so much now that a barrier has been put up around it to stop it being eroded by the kissing ‘tradition’). Thanks to Sarah’s brilliant idea though we bought some flowers which we distributed amongst the graves we visited. I was really proud of us, given everyone else was just snapping away aimlessly with their cameras. We did unwittingly just about end up in the middle of a funeral procession, as we turned around from Georges Seurat’s grave to notice the staff had scattered, a tomb was open (explains the staff) and a brass band coming round the corner. The friendly gardner kindly suggested we moved on. I had to make an effort not to dwell on things after that as it was a real reminder of where we were and what goes on there – it’s so easy to not forget, but to…ignore it, I guess. Again it made me thankful we had the flowers! Once again we’d completely lost track of the time and it was lucky that a (well meaning?) man trying to chat us up about our flowers told us it was closing in half an hour, as it was 5:30. We had to pick up the pace after that to work through our list and unfortunately got a bit lost and had to give up trying to find Molière, as the thought of being locked in the cemetery was not too inviting. We then headed to the Place de la Bastille, aka where the French Revolution is generally* considered to have started, before exploring the old Marais district. *Generally. Some of us know better ;)We found the Place des Vosges which was a nice sheltered park surrounded by beautiful houses, where we relaxed in the sunshine before looking for dinner. After our decent lunch we weren’t very hungry so got pretty excited when we found an eatery with ‘snack’ in the title and pasta for only €5. Perfect, right? Wrong. What came out were two huge TAGINE dishes of pasta, great value for money but so not what we were after! It didn’t help that we’d both ordered the same thing. One would have been fine and we could have had a €2.50 dinner! We eventually managed to get a doggy bag and then headed back to meet Amanda, before going to see the Eiffel Tower all lit up. The pictures didn’t turn out very well but you get the idea. Then it was hometime and bed after midnight which was our latest night yet! Our last day (Wednesday) got off to a slow start and was really a catchup day. We started off at the Pantheon, a basilica where many of the republic’s grands hommes (and femmes) are interred – think of a writer, politician, scientist or humanitarian and they’re probably there, if ‘you’ as Joe Bloggs has heard of them. Once again, like at Père Lachaise it was quite easy to have the disconnect and not really think about the fact that there were dead people’s bodies in there. Too graphic? Soz. After that we headed next door to the Bilbiothèque Ste-Geneviève, which I had learnt about in the art history class I’m taking here. That counts as study, right? We were able to go in and have a look supervised by a guide, who while obviously well meaning, was just BIZARRE. There’s no other way to describe the experience. We then grabbed lunch nearby so Sarah could cross ‘champagne on a terrasse’ off her list, and then meandered towards the Seine. I was disappointed to discover that Shakespeare and Company only had English books! This is potentially a well known fact, but I wasn’t expecting it. I thought I might actually buy something meaningful, i.e. a French book. The vendors along the river had much more what I was after, but it turns out if you want a 1930s illustrated copy of Baudelaire, you’re going to pay for a 1930s copy of Baudelaire. So we continued on to buy a baguette and some Orangina and go and have a picnic on the Champs de Mars in front of the Eiffel tower. It was so nice just to relax and it was a perfect way to round off our trip! After that it was back across town with our bags and back to reality in cold, rainy Lyon. It has actually been FREEZING today, only about 8 degrees! This is worry as I’m currently in the middle of organising how to ship most of my winter stuff home. I don’t want to have to need it; it’s one month till summer! Aside from Paris, not a lot to report. I went out for dinner in Vieux Lyon and had one final pizza night (may they rest in peace) with Jamie and Jess, who have now both left as the SELF courses finished a couple of weeks ago. Everyone is gallivanting off around Europe while I’m stuck here with exams for another two weeks! The worst part is, they’re actually hard so I have to do some serious study. I had my first one, a translation exam, this morning, which went well fortunately as I had NOT prepared at all. So naturally I took the day off as a reward. I’ll try and get started on the study tomorrow…maybe.